First there is a matter of an anonymous person publicly accusing Msgr. James of criminal activity - which this "Diana" has done many times. This "Diana" refuses to use his or her actual name because "she" claims that they are the ones being persecuted. That's funny, because for almost a full year now it has been Msgr. James who has been publicly persecuted, first by his own bishop, second by the new Sanhedrin at the Cathedral (Msgr. David the VG, Jonathan Bordallo, & Sr. Marian Arroyo), and third, by this cowardly neo blog. 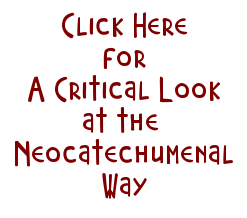 As mentioned many times before, this cowardly neo blog has done more to make our case of the evil fruit of Kiko Arguello than anything we could have said on our side. 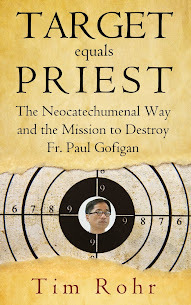 The willingness to publicly castigate and accuse people by name from behind an anonymous shield should say everything we need to know about what the neocatechumenal way does to people. Just yesterday the Gospel was about Jesus warning the apostles that they would be sent out as "sheep among wolves". Can you imagine Jesus then saying "so I want you all to hide and change your names so that no one will know who you are." LOL. Yet, this is what they apparently are taught in the Neocatechumenal Way as the "Diana" continues to denigrate and hurl accusations against Msgr. James and Fr. Paul. Thanks for teaching the world, Diana. Thanks for teaching the world about the difference between Jesus and Kiko Arguello. But going on, we need to repeat some facts. Msgr. 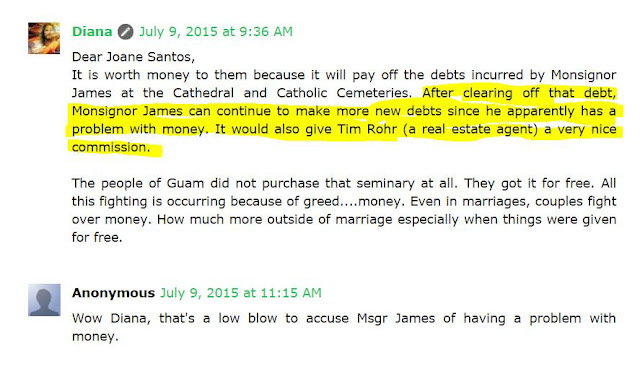 James has no authority of his own to create any debt. All his authority comes from the Archbishop. The 7.3 million dollar loan to renovate the Cathedral and the Cemeteries, the other loan to build the St. Therese chapel, both of these loans, in fact all the loans in this diocese are signed by Archbishop Apuron because - as Diana likes to tell us - he has all the authority in this diocese. In fact, it was Archbishop Apuron who put Msgr. 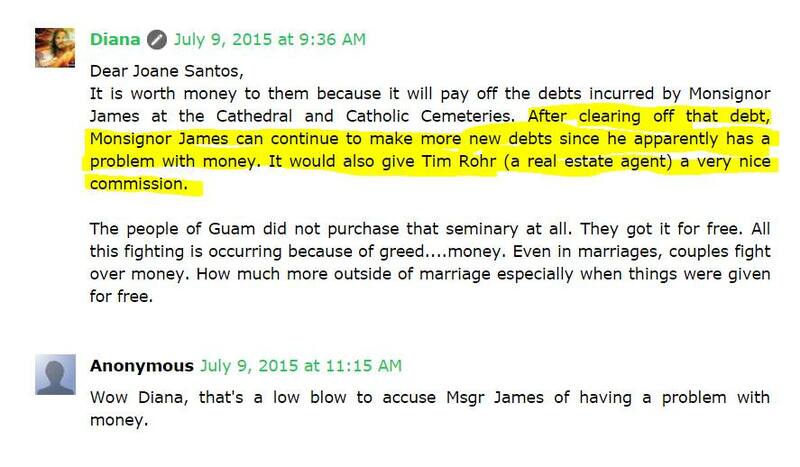 James in debt because while Apuron signed the loans, he tasked Msgr. James to pay them back. And pay them back he did. Paying off the initial 7 million dollar indebtedness of Archbishop Apuron down to approx 1 million at the time he was fired. This was attested to on August 6, 2014 by Joseph Rivera and Art Ilagan, both well known professional men who lent their expertise to assisting Msgr. James in the monstrous task of paying off the Archbishop's indebtedness. But here's the real kicker. Even if all the allegations were true (and Apuron has admitted privately that he does not know them to be true), Church law holds the Archbishop responsible, not Msgr. James or any other priest. It is Apuron's responsibility as bishop to see to the financial health of his diocese, yet, he neglected this duty for years while he galavanted around the world on the Diana's trash bag money, and of course the envelopes from "Cashee." The only mud slinger is you Tim. You mention Msgr. James misgivings more than any other publication in print and digital combine. In fact, if you google Msgr. James, it is your blog that gets the most hits. YOU are the guilty party. Go to confession poor soul. LOL. Any intelligent person can see the stupidity of your remark. Which is why you can't see it. NEO/NCW CULT COWARD @9:59AM; be it known that the truth has set us free. I personally know Very Reverend Monsignor James Benavente since we both live near Santa Barbara Church in Dededo. From Altar Boy thru the ranks to his elevation as Chaplaincy to Our Holy Father Pope Frances; he has demonstrated more faith and honor to the One Holy Catholic and Apostolic Church than any of your activities combined. Crawl back to your hole you evil serpent of Anti-Christ KIKO.... Know that your remarks here will follow you to judgement day as you accuse one of God's most holiest of wrong doing. PS; Obey your master serpent's Pius and Apuron instructions and stay out of the Jungle. Clearly your words are not helping their cause which is swindling $$ and indoctrinating salves to suite their greedy needs. Anonymous @ 9:59 AM (or should we call you by your other name - "Diana?") I now see why Fr. Pius demands that you guys consult him before opening your mouths. Embarrassing. yeah, more on "cashee"--must be something incriminating going on in those interactions between this individual and the archbishop/pius that could warrant an official investigation? Cashee cashee been very quiet past weeks not been seen around town. Jealousy. Pius and Cashee competing for Apuron's affections. It never ceases to amaze me on how stupid Diana can be. No matter what the situation is he/she stands ready to canonize any persecuted neo and demonized any intelligent thought. The only thing more despicable is how tony and Pius continue to prop up the Diana. But then again, when the truth doesn't work for you, confuse the whole situation with inane stupidity. This is what makes Diana so important to the tony and Pius nuts of the world....he/she excels in inane stupidity to the level not seen since the third reich. What is sad in all of this is that mind control has been used against our neighbors and relatives who chanced upon the way. And this mind control has numbed all sense of right vs wrong and replaced it with persecuted them vs judas us. People the the neo-confused way: wake up to the truth and save yourself. I'm praying for you. The Metropolitan Archbishop does not read blogs. He said so. This is another example of trying to re-write the truth to fit their Neo Interest. It is very clear what they need to do to be credible. Rohr has documented every thing that Apruon and his Neo masters perpetuated on us. All you need do to turn the tide is to refute Tim's posting with facts. This would put pause if it can be proven to be true to begin to question the motivation of Rohr. Other wise your posting are mere bable putting up a weak smoke screen to turn the tide. Typical Kiko type maneuver also could be manure. This is a vivid example of Neo (Kiko) defense. .
forgot to add put up or shut up..
Has anyone ever notice that the name Diana is an anagram of Adrian with the letter "r" omitted or is it just me? Somehow, this Diana person continues to bring AAA's wrongdoings and lies out into the public purposely. It's like sending AAA out to the slaughterhouse for some hidden agenda that only Diana knows about. The people in the Jungle are waiting to see your next stupid move Diana or is it Adrian? Anonymous/James T. (July 11, 2015 at 12:47 PM), when "The Diana's" blog started, the idea that the administrator might be Adrian came up because, as you pointed out, "Diana" is an anagram of his name, minus the "r." As you noted, the tendency to bring attention to AAA's activities and lies — while claiming to defend AAA in the administrator's imbecilic way — does seem to point to Adrian. However, over the months, it has become apparent that, despite "The Diana's" claim that "she" is the only one who has access to that blog, the writing style(s) and the ready responses regarding GIRM, Canon Law, etc. betrayed the fact that there are several persons who write on behalf of "The Diana." Of course it's easy for "The Diana" to trash people like Msgr. James, Tim Rohr, Chuck White, etc, because the people on "The Diana" team hide behind that false identity while Tim and Chuck are principled enough to put their names on what they write. Will the identity of "The Diana" ever be revealed? Only time will tell. But in the meantime, I'm not holding my breath. Deny, Deny! Deflect, Deflect! Destroy, Destroy! !